As Orlando’s leading off premise catering company, John Michael Exquisite Weddings and Catering has been asked to cater some unique events. But as engagement season began, we had a request to cater a wedding proposal that even surprised our team. The proposal dinner for two was the simple part, the location was possibly one of the most inventive spaces where our team has ever worked. 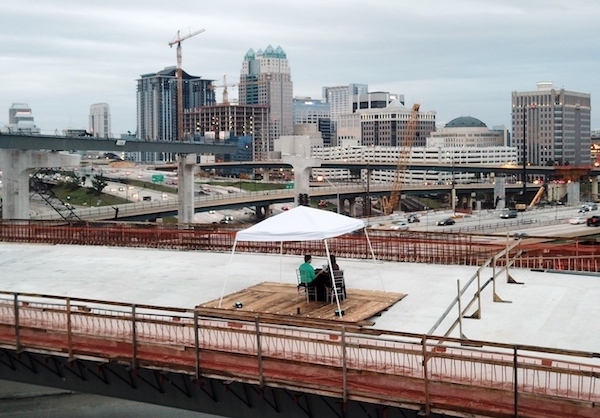 The groom-to-be was employed by the Department of Transportation and had arranged for a wooden platform and a small tent to be placed on an I-4 overpass, overlooking downtown Orlando that was currently under construction. Our John Michael Exquisite Weddings and Catering team had access to the space just over an hour before the guests were to arrive. We provided a table for two set with matte black linen, black napkins and two silver chiavari chairs with black cushions. The table was set with glass beaded chargers, china, flatware, decorative lanterns and votive candles as well as champagne glasses. 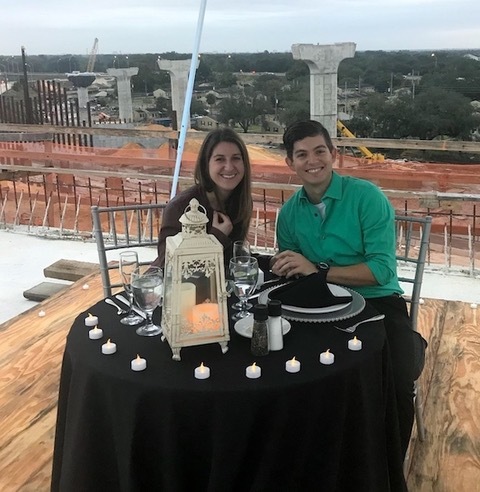 The couple enjoyed dinner, served by our team dressed in black, as traffic whizzed by below them off in the distance. And what better way to pop the question than over delicious Homestyle Cheesecake with Chocolate Sauce and Fresh Strawberry Puree? Our John Michael Exquisite Weddings and Catering team could not have been more thrilled to be part of this incredible experience!